Russians, as many folks in the World have a lot of reason for feast- weddings, funerals, newborn member of family etc.. etc .. etc.. This rules relate to situation when you have free evening and company of friends, who want to spend that time with you talking and drinking vodka. So, in short, how to drink with Russians and remain alive. The company, which intends to drink vodka, mush have from three to seven members. Less than three is deadly dangerous, more than seven senseless, because such company inevitably disintegrated for two with less number of members. No woman allowed. Spread a newspaper. It must be black and white newspaper with black and white photograph, no pages with yellow or rose colour are allowed. Put on the newspaper bottle, faceted glasses (250ml) on the number of members, then put the snacks. It is available to replace faceted glasses with shot glasses (50-70ml), but that not recommended. Snacks mean only cold food - sandwiches, canned goods (meat or fish), fat, sausage, smoked meat, processed cheese (preferably "Friendship"), fruits (apples, no exotics), pickled vegetables and mushrooms. Hot drinks and meals are not allowed - this is a huge violation of the canon! Wash vodka down is forbidden, only sissies do that! Elect the person, who will dispense vodka to glasses. This is very critical position, his art of dispense makes the mood of the feast. All the portions dispenses from the one bottle, despite that the portion will be less than standard (70-150 ml). If you want more volume of portion take the bigger bottle - 1L instead of 0.5L. Dispense portions from different bottles is huge violation of the canon and big mistake of dispenser ! Portions must be equal despite of the degree of intoxication of the dispenser ! Standard portion is third or half of glass. The full glass usually drinks the person, who is late for the party. Empty bottle must be removed from table immediately, because remain it to the table is very bad sign. Each portion must be drunk for one go. Dividing portion on a parts is very disrespectful to buddies. Toasts should be short when taking vodka (for health; let's tremble, let's go; for women; for us, men; for that we have everything; etc. ), vodka, not wine, baddy can begin to hear your long toast, but then, on the middle, fall asleep or under the table. In addition, in the culture of drinking vodka, toasts no important but very important is table-talk. Toast must fit into the way of table talk. The third toast is usually devoted to something important - parents, friends in the army, military man or pilots drinks for of dead colleagues standing up and not clinking glasses. Dispenser usually begins the table talk. Topics of table talk (in order of drunk portions): cars, sports, life, politics, women, the identity of buddies (in a admire way). Table talk may be interrupted by the jokes in way of talk, pertinent joke can change the topic of conversation. During the table talk, when discussing sensitive issues, it is forbidden to get personal, rude, threatening buddies. In this case, the feast emergency stops or pauses, and the offender is removed from the table. 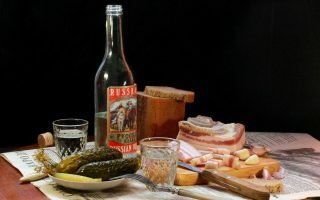 Any member of the feast may refuse further admission of vodka at any time without giving a reason, though usually formally give such reason like weak health. The feast ends with a consensus decision of all companions, or their physical inability to continue the feast. Feast also stops when the companions left on foots remains less than three persons. Drink up the residue remaining in the bottle and liquidate the remnants of the feast (Rolled up in paper and throw away leftovers, empty bottles put in the bin). In addition, they must take care of the sleeping buddies. Sleeping buddies should be treated with respect - bring them safe and sound home, or move to the bed.